I am not a very good photographer. 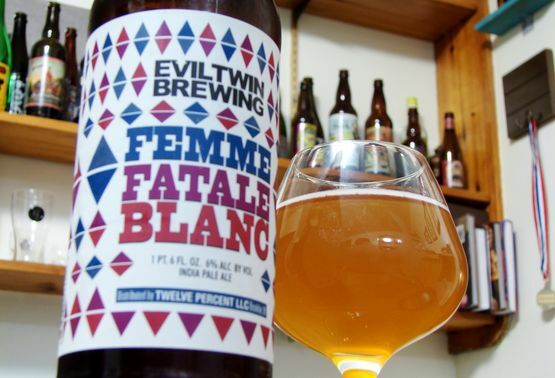 A couple months ago, when I reviewed Evil Twin's Femme Fatale Brett, I noted that there were only maybe one or two styles that are harder to find a bottle of than a Brett IPA. Maybe it's just the general lack of understanding regarding 100% Brett beers, and how they work, but few seem willing to tackle this quirky sub-style, despite many homebrewers touting its potential. Well, Evil Twin is still carrying the torch, and has now released not-one-but-two variations of its Femme Fatale Brett IPA series: first a "noir" spinoff, and now a riff on the original with Nelson Sauvin hops — obviously really pushing the Sauvignon Blanc connotations. Well, I didn't even have to open the bottle to guess that Nelson Sauvin hops in a Brett IPA would be a great combination (which is why I brewed one myself in March, with Brett Trois and a range of New Zealand hops). The nose is brightly fruity, and while the aroma out of the glass is not as huge as many IPAs, it's clear that plenty of Nelson Sauvin went into this. That berry-grape-grapefruit character will never get old. Something a bit grassy and funky lurks beneath the fruit, and upon tacking a sip, the yeast character takes over. Much sharper than the fruit flavors in the nose, the taste is dominated by spicy, phenolic yeastiness, with a earthiness that's very reminiscent of Belgian yeast strains. I said the same about the original Femme Fatale Brett, but with Nelson Sauvin rounding things out, Blanc is definitely an improvement upon the original. The flavor is big and layered, a twisted blend of tart berries, crisp sharp orange zest, and funky pineapple, over a beer that's earthy and dry enough to be highly drinkable. And just as before, it needs to be noted that most 100% Brett beers won't be overly funky, at least, not unless you let them age for a year or so. A lot of Brett strains, when used for primary fermentation, express themselves very similarly to Belgian and saison strains. While I'm not sure what strain this was brewed with, you can certainly treat it as a Belgian IPA — it even tastes a bit as if there's some spice or orange zest in there, though I doubt there is. Evil Twin's choice of hops provides some necessary balance to Blanc, smoothing over the phenols and providing a lot of depth; a funky, refreshing, uniquely fruity brew. Availability: Rotating release. 22 ounce bottle.